It’s been a funny couple of months. The end of 2016 was crazy. In just 2 months I spent time in 11 different countries on 5 different continents. I was a part of two big campaigns – one in India and the other in Spain and Italy. I taught a travel photography workshop in Cuba, and also solo travelled all over Southern Africa. If I’m being honest, by the time I got home to Phoenix, I was exhausted. Now, you’re probably thinking: aren’t you Canadian? How is Phoenix home? Well, to be fair I use the term “home” fairly loosely. And, I have plenty of “homes” around the world. Phoenix is one of them. My parents bought a house there a few years ago when the housing crisis in the US meant for extremely good deals on properties. They’re retired now, and spend the winters there playing pickle ball and avoiding the cold weather of Canada. It was so good to be back around family. I’m pretty sure I drove them mental though. My past couple months of craziness left me a little rough around the edges, I think. And, I think my levels of patience and “chill” were at an all time low. Still, it was so good to have them around. There’s nothing better to ground a person than being around family who really reminds them where they came from, and who they really are. I’m very thankful for them. They always keep me humble – or at least, they try. I didn’t just chill out while in Phoenix, though. There are so many places to see and so many awesome photo locations that I had to get out and do some shooting as well. Plus, I was way behind on some work for a couple clients, so getting out and shooting was kind of a priority. 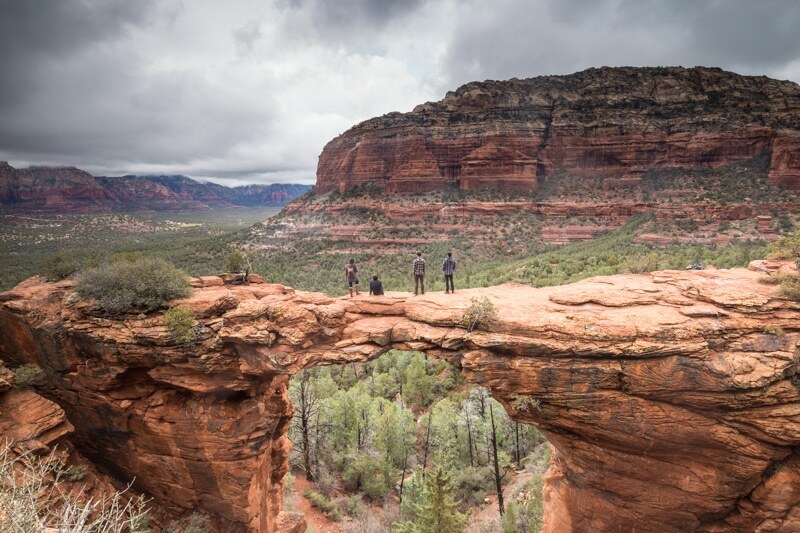 One of the locations I really wanted to shoot was the Devil’s Bridge in Sedona. I’ve been up to Sedona a couple times, but never knew about the Devil’s Bridge. So, when I saw some photos I realized that it would be a great place to get some cool shots, and also get some images for my clients. Of course, like nearly every photogenic spot in the US it took some patience to get the shot I wanted. The Devil’s Bridge was packed with people right up until the minute the light disappeared. It was a Friday right before the holidays, so it might have been more busy than normal. But, the shots came out cool – despite a lack of good light – and the trip ended up totally being worth it. I already posted about my trip to Joshua Tree in an update recently, so if you haven’t read/watched it you can do so here. I do have to say, though, this trip was amazing. And, I think that it lead to my favourite photo of 2016 which is below. My favourite photo of 2016. I was planning on checking out a place called Chelly Canyon in Northeast Arizona. However, when I looked at the weather reports they were for rain and possibly snow. So, I quickly changed my plans and headed towards Zion National Park. When I got there in the late afternoon, the light was beautiful and there was this perfect blanket of snow coating the hills. I got the gear out around sunset and did some shooting along the river. And though I’m fairly happy with how the images came out, the light was flat and the skies turned overcast in a hurry. 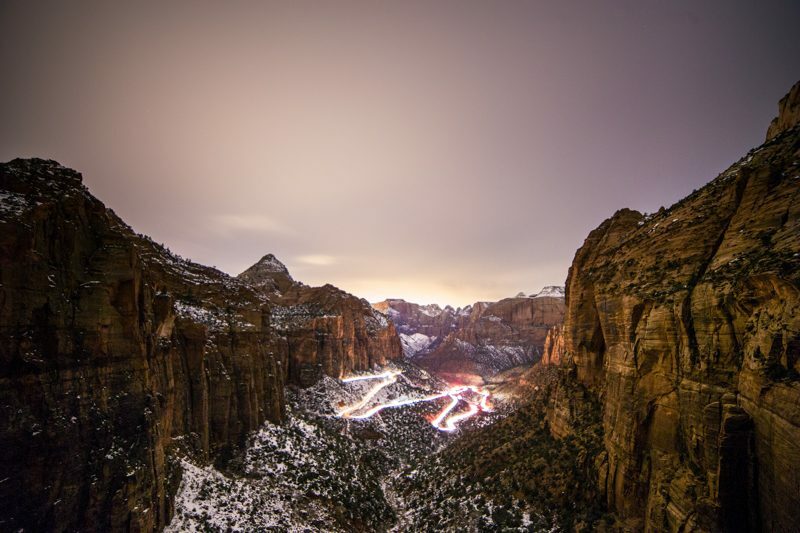 Despite the terrible weather, at dark I decided to hike the Canyon Overlook in Zion. I have had a shot in mind for a couple years from that location, but haven’t had the chance to get back to the park until now. So, despite the clouds, I wanted to test out the shot. The good news is that the shot works. The bad news is that there were no stars to get the shot I the way I wanted. At the end of the day, I still kind of like the image I got. It’s different, and I love the river of light and how it bounces off the walls of the canyon. 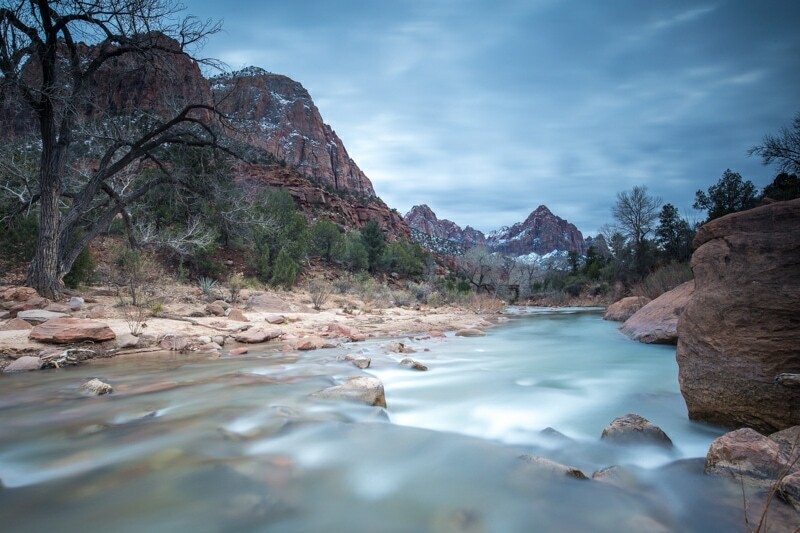 By about midnight, it was pouring rain in Zion. At 5am with the weather still coming down, I decided to bail on my plans to hike Angel’s Landing for sunrise, and left the park heading towards Page and Horseshoe Bend. Of course, though there wasn’t bad weather predicted, I crossed through a nasty blizzard and arrived in a rainy/snowy Page just before dawn. I again decided to bail on my plans, and headed to the South Rim of the Grand Canyon. Again, there was fog and a bit of snow. But, I managed to find a cool place to fly the drone outside of the parks, and then got one minute of cool fog and light on the canyon. 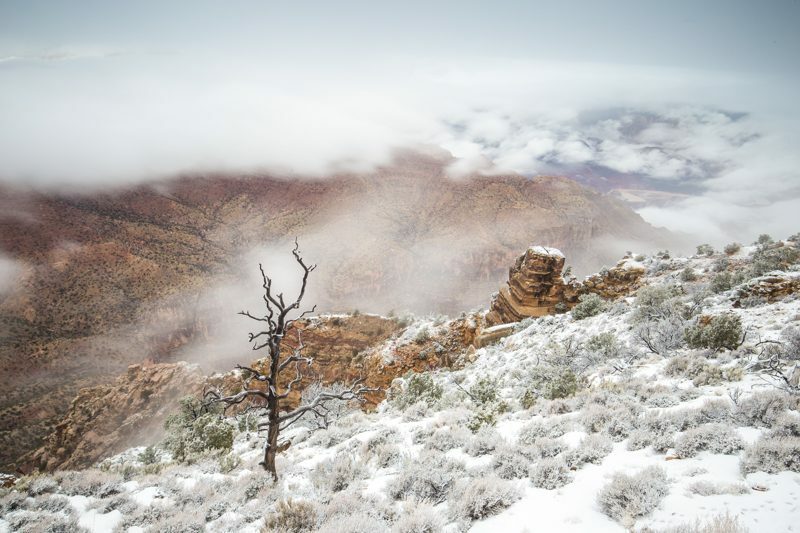 Of course, after that minute there was so much fog and snow you’d have no idea a canyon stood at your feet. So, I licked my wounds and headed back to Phoenix. It’s a funny thing following your heart. Sometimes, you just feel like you need to go somewhere. You feel like you need to be somewhere. As much as I love the Southwest of the US, my heart was begging for me to go to Colombia. So, I cut my time in the US short and hoped a couple planes to Medellin – a place that was once “home” for me, and will always have that feeling, I think. I’m in Colombia for a couple weeks and then I’m off to Spain via California. Stay tuned! Hi Brendan! Your photos are impressive. 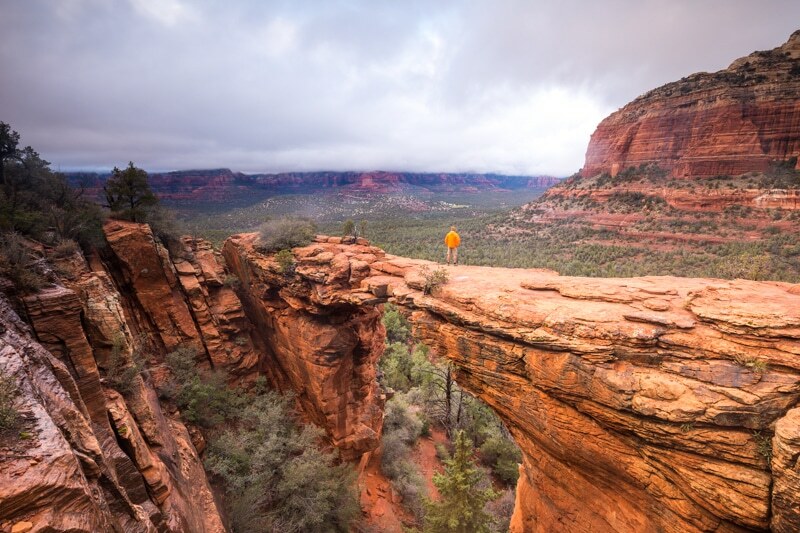 Arizona is one of the most overlooked places for scenic locations and photography. It’s nice to know that the place is getting its due respect. Wish you all the best for your upcoming travel plans in 2017. 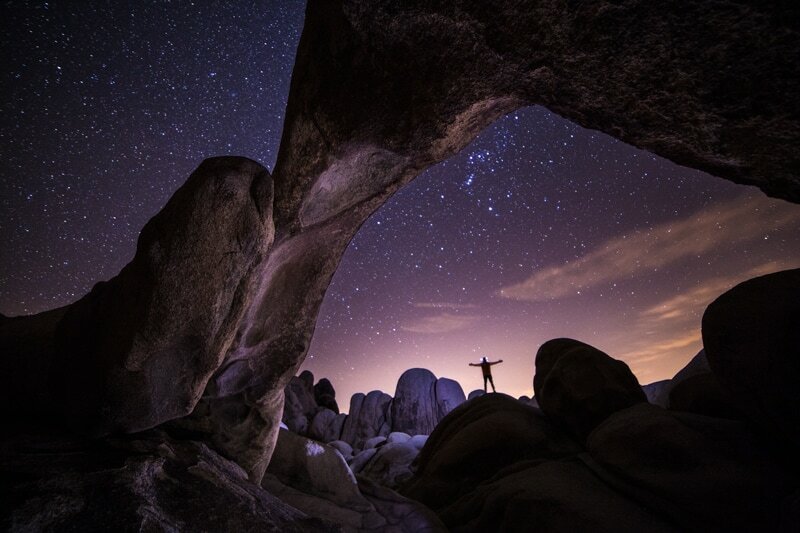 I really love your shot at Joshua Tree National Park! How did you accomplish that? Thanks for sharing this blog. Pictures are so clear, awesome view points.